Meeting dates and times for the Village Board of the Village of Kingston for the Calendar Year 2014. Meetings are the first and third Monday of every month unless it falls on a holiday, in which case it will be held the next day, Tuesday. 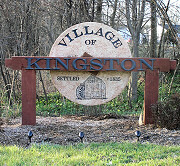 Meetings start at 7:00pm at the Village building at 101 E. Railroad Street, Kingston, Illinois.